Usually food bloggers say that they ‘adapted’ recipes from other blogs. I’m not a real food blogger, so I don’t adapt recipes. I just trust that if they made it onto a blog its because they tasted good. In this case, I used a recipe from JoyOfBaking.com and omitted the cream of tartar because I didn’t have any. I topped them with chocolate buttercream (6 ounces butter, 6 ounces icing sugar, 1 ounce cocoa powder) and then put pieces of candied citrus on top, which was a good idea in theory and a sloppy-looking idea in practice. The chocolate frosting was delicious but came out looking like poo swirls of CakeWrecks fame. And then I put them in my cupcake carrier for its inaugural use (I insisted on registering for it when I got married. Then I decided that was ridiculous. Then I decided, hell with it, I want a cupcake carrier. Then I didn’t use it for a year and a half). Anyway, I got about ten feet from the house on my bike with the damn cupcakes before they all fell out of their little holsters and smushed all over the place, and then it didn’t matter that they hadn’t looked that good to begin with (could’ve seen that one coming). I put them back in place, biked two miles one-handed (including up the only hill in Cambridge!) and then lied and told everyone they were beautiful before I spilled them. 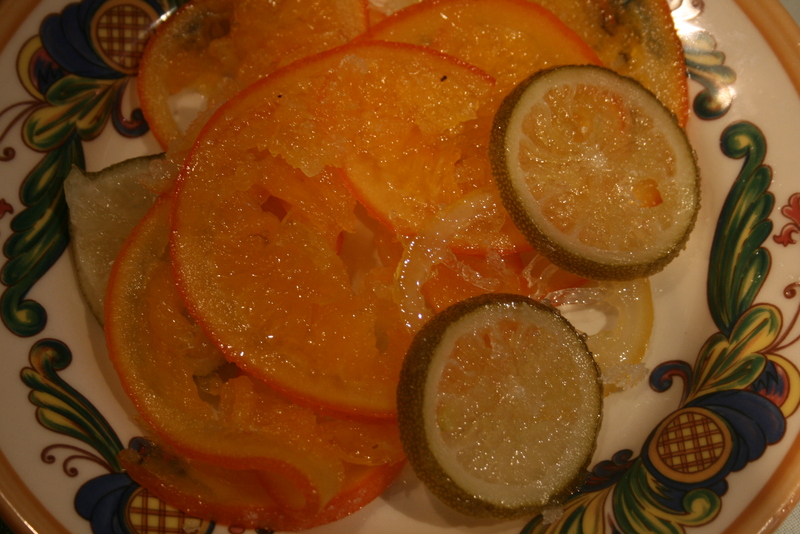 I didn’t intend to post about them originally so the only thing I have to show for my efforts is the candied citrus. 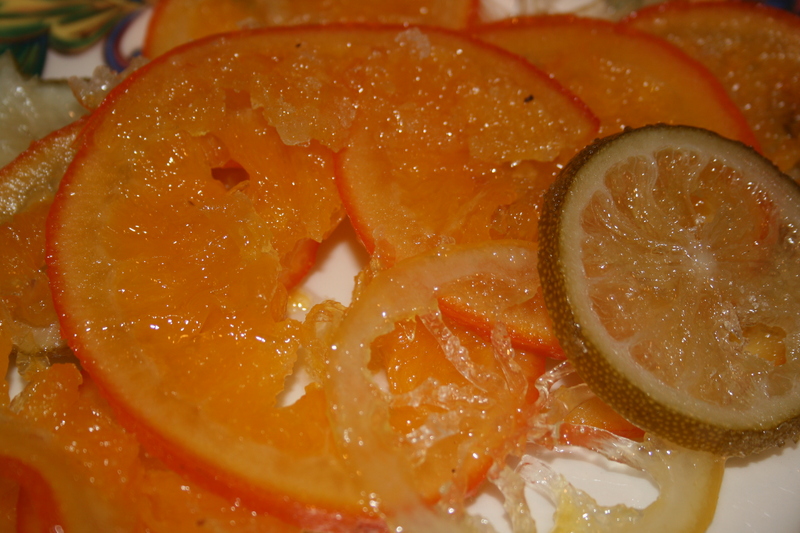 I was inspired by a recent post on winter citrus from MattBites but the local grocery didn’t have blood oranges, so I used oranges, lemons and limes. I’d never had candied lime before, but its pretty amazing. Candying the pulp along with the peel makes everything a little sloppier and wetter, but also much, much faster. The cupcakes were great, but I would note that they were utensil-intensive. It would help to have a hand mixer and a stand mixer; an electric mixer of some sort is absolutely essential, and you go through a lot of bowls and spatulas and whatever else.